In October a friend of mine posted about a Secret Sister Gift Exchange. Maybe you have already heard of this? You post on Facebook asking for 6 friends to participate and when they reply you send them the details. To participate you only have to send one gift, and you will get 36 in return. Well, after mapping out the number of passes my name makes, it only works out to 12 gifts, IF everyone participates. I had already sent out the info to my six gal pals and purchased my $10 worth of gifts when I started getting emails and texts from friends saying this was a scam and an illegal chain letter. So, I did a little research. I felt really skeptical and a little embarrassed that I sent this out to friends. How could I have not known this was a scam? So, I sent a group message and cancelled the entire thing. I still sent a gift to the woman on my list because I knew she was probably just as excited as me to participate. I didn’t want her to feel gypped. I thought no harm in bringing a smile to someone’s face. Who doesn’t love to get a fun gift in the mail? Just a day or two after I cancelled, a package arrived for me and I thought, “Did I order something online and forget about it?” Nope. 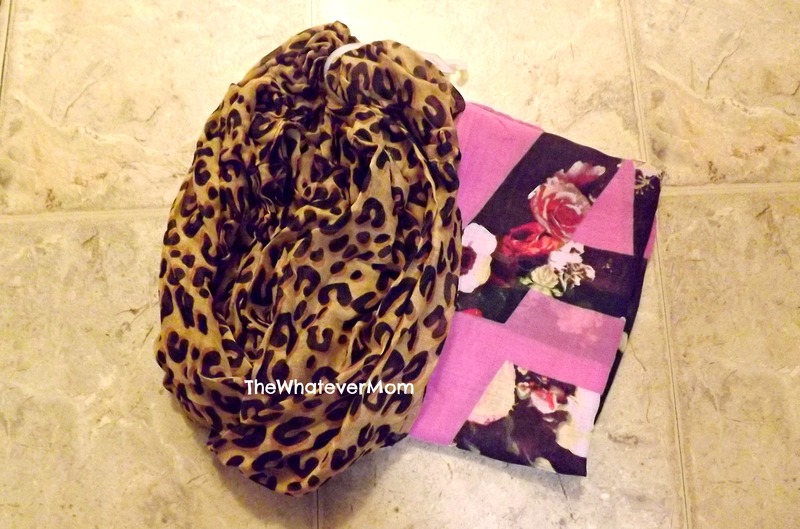 It was a gift just for ME- two beautiful scarves! Both sent from a mom I already know who did not reply as one of my original six sisters. A week later another package arrived on my door step addressed to ME. I did not recognize the return address and I could not figure out who it could be from. It was another secret sister gift! 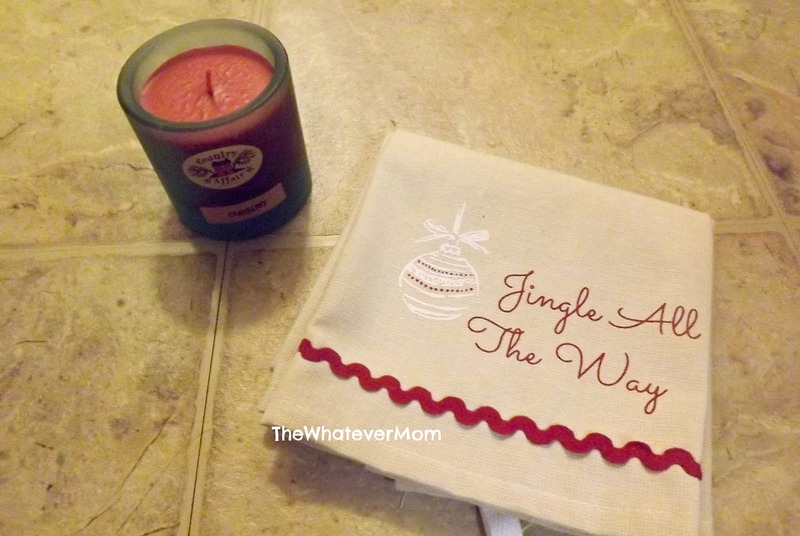 This time a fabulous candle and a beautiful dish towel to hang in my kitchen. This gift came from someone I have never met. So, I sent her a thank you card and in return she sent me a Christmas card. Despite everyone’s skepticism (including my own) I have no regrets in participating. I think if you are sharing with friends you know personally, and the original poster isn’t the only one benefiting and getting all the goods, then this is just a fun way to brighten someone’s day. As a mom it is rare I get gifts just for me. As much as I would like to I wouldn’t spend money on these things for myself (which are all things I love). Having someone take the time to purchase a thoughtful gift for me to enjoy is truly uplifting. I am grateful for the two optimistic and caring individuals who threw caution to the wind and made me their secret sister. I hope someone else did the same for them! If you have the same concerns, or only want to exchange gifts among friends you can use this Secret Santa Generator at Drawnames.com (I have never used this site personally, nor do I endorse it. Just offering as a suggested alternative). « FRIDAY FAVORITES INGLOT REVIEW AND GIVEAWAY FROM FACE BEAUTY STUDIO! Glad that it all worked out and see, you got some really lovely gifts. I am with you, though – I would have been skeptical about it, too. Too bad this is a scam, although you did receive some really nice gifts. What a fun idea!! 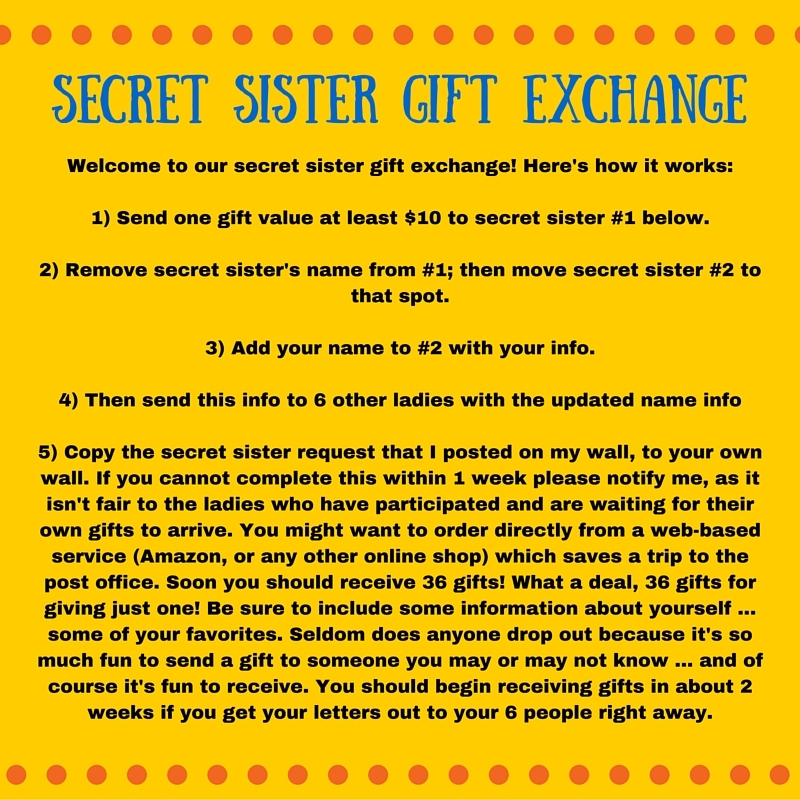 I haven’t heard of the secret sister gift exchange but it would be fun. I am sorry to hear that it was a scam and thank for warning others of how dangerous it is to believe everything that you see on the internet. You have to be so careful. Awww, it’s such a great idea though to do with your pick though! I’m glad it worked out! Glad it worked out you! A few friends.if mine signed up too and got nothing in return. Normally I would have signed up but this year I opted out and I’m kinda sad I did. I saw this on facebook but I totally thought it was a scam so I didn’t participate. Now I am sad I opted out. So glad it worked out for you! Too bad it ended up being a scam, always some people out for themselves and spoiling things for everyone. Sounds like you made a a new friendship though! This is such a cool idea but I would definitely be a little weary that no one would reply. I think I’ll modify it and try it out with a group of friends instead next year! Aw. At least you got some sweet gifts! Glad you were able to get some lovely gifts after all. I saw this going around and the warnings too. I hate when something sounds too good to be true. I always want these things to be real, but it seems you really have to do your homework! I am always skeptical of these types of exchanges. I’m glad you were able to receive a couple of beautiful and fun gifts! There are a lot of scams out there. Earlier in the year I was sent a secret shopper one. Wonder how many people fall prey to scammers. I’d be sceptical also if I receive this kind of message on FB, but you have the nice result at the end. They are lovely gifts. I have heard of this, never participated and would not have known it was a scam either. But look at the lovely gifts you received! We all fall victim to things we feel silly about later. I’m so glad this worked out for you in the end. Thanks for sharing! It’s sad that things like this have been messed up so much that they’re illegal. I think they’re fun as long as everyone is just doing it to bless others. Cute idea! I’ve never seen the secret sister gift exchange but I’m glad it turned out well for you! I’ve never heard of the secret sister gift exchange but I’m glad it turned out well for you! It’s a super cute idea! I think there are lots of ways to do the secret sister thing where it works out for everyone! Glad it worked for you! I heard about this, and someone told me it was kind of like a pyramid scheme and the people at the top ended up getting the most gifts or something. I don’t really understand it, but I would definitely be skeptical!